Shall internet content be free. We don’t think so. Instead we believe in solutions that make the purchase worth every penny. And when we say penny, that’s really what it is, or at least most often. This is my effort to solve medias big problem - how to get paid for content. Simplicty and low price is key. Stope offers a solution where users can get a Media Wallet in a few seconds. They can then start purchasing articles, and as media own the content, they get the big share of the revenues. Does it sound interesting? 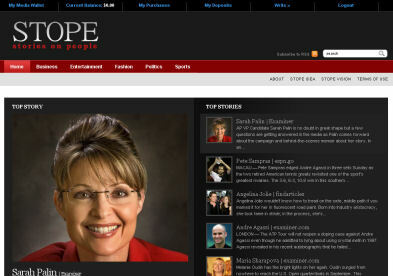 visit stope.com or contact me to learn more. 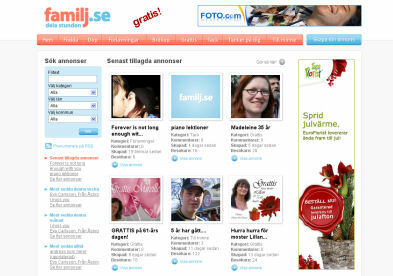 FoodFriends, an idea since several years, hopefully with a bright future. Industry-focused social networks is something I strongly believe in. Paired with this industry's strong connections outside their own working place, makes it the perfect target for a socail network. The restaurant industry has taken time to adjust to the IT-revolution. When laptops and wireless networks are becoming increasingly popular among restaurants, and their owners, it is time to give them a full package of products that will be the owner’s perfect recruitment base and employment manager, the staff’s favourite site, and the supplier’s best marketing platform. A few years back I went to my long time favourite restaruant, Grodan, and asked them why they didn't have a table management system, as it had such obvious advantages. They showed me how they worked, and I then started building an online application to meet all their needs. Are you a restaruant in need of a flexible system, that to full extent has tried to copy the work-flow of using paper and pen? 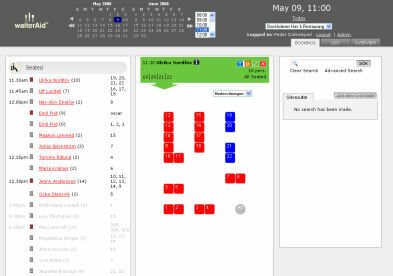 Have a look at WaiterAid our totally adjustable table-booking system for restaurants. A graphical view of your restaurant gives you a click-to-book possibility. 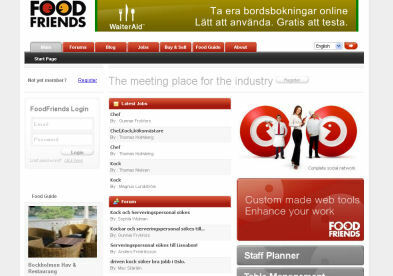 WaiterAid provides the tool to keep track of your customers and bookings to enhance your service. Shopping on-line is usually smooth and comfortable. However, trust is everything. 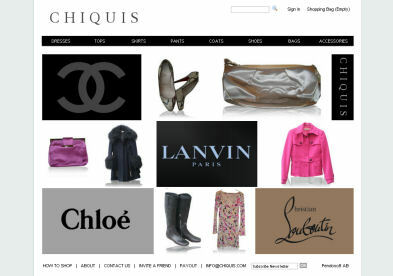 In relationships, in business, and it’s absolutely essential for shopping on-line. Thus, by writing a few lines about ourselves, we hope you’ll get to know us a little bit better. We can lay the foundation for what will hopefully evolve into a mutually beneficial, enjoyable and lasting friendship. Logisticator is a tools and network platform for small and medium sized logistics and freight forwarding companies as well as for individuals from this sector. 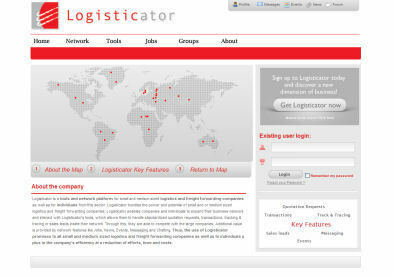 Logisticator bundles the power and potential of small and or medium sized logistics and freight forwarding companies: Logisticator enables companies and individuals to expand their business network and interact with Logisticator’s tools, which allows them to handle standardized quotation requests, transactions, tracking & tracing or sales leads inside their network. Through this, they are able to compete with the large companies. PBlink is a CIEP (Confederação Internacional dos Empresários Portugueses) initiative to bring the Portuguese business community online in a social network. PBlink wants to promote and facilitate communication, increase peers collaboration and share information to present investment opportunities and let members expand their businesses. It also enables companies and organizations to rapidly search, find, qualify, evaluate and interact with partners, customers, new markets and get new ventures. Livsminnen is a memory book of loved ones. 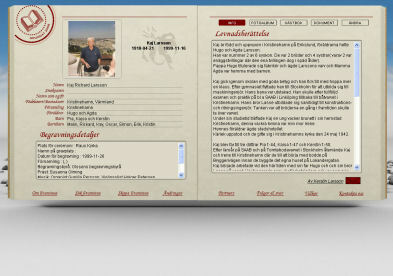 An idea of preserving memories, images and documents for generations ahead. There is also a possiblity fo any person to create thir own memory book about themselves. The memorial will be published after the person dies. Copyright © 2001-2010 Lotta Dinkelspiel. All rights reserved.